Direct Power Technologies, Inc. is the first company to introduce an electrical system that can provide 400vDC directly to computers and servers. This is a voltage already utilized internally for all computer operations. In partnership with INTEL, SUN MICROSYSTEMS, Lawrence Berkeley National Laboratories, EPRI and ECOS Consulting, Direct Power Technologies, Inc. has demonstrated the operation and energy savings of a 400vDC power distribution system. 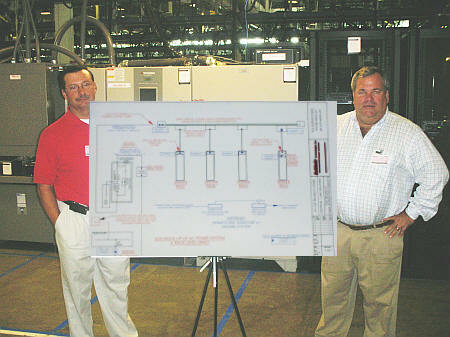 Mark H. Baldwin (right), President, Direct Power Technologies, Inc., a company formed in 2006 to introduce new power generation and distribution solutions to industry. Mr. Baldwin is also the President of Baldwin Technologies, Inc., an equipment representative and turn key critical power system installation firm for Data Centers and other critical facility operations since 1994. Mr. Baldwin earned is Degree of Business Economics at the University of Delaware and has been providing solutions for Data Centers and critical facility operations for over 20 years. David E. Geary (left), PE, Vice President - Engineering, Direct Power Technologies, Inc. Mr. Geary is a licensed professional electrical engineer with twenty five (25) years of professional engineering experience in all aspects of high tech facility engineering, facility management, engineering management, project management, electrical engineering design, contract management, and consulting engineering company management. He has specialized experience in high tech facilities such as, computer centers, communication centers, operations control centers and medical facilities. Mr. Geary is a graduate of the University of Maryland, College Park, with a Bachelor of Science in Electrical Engineering. He provides engineering technical engineering innovation, vision and leadership for Direct Power Technologies, Inc.